Assassin's Creed IV takes the story of Desmond Miles' ancestry backwards. While AssCree3 was set around the Revolutionary war, AC4 takes place approximately half a century earlier, and stars Connor's grandfather. 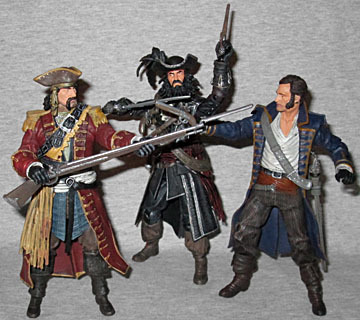 But even if you don't care about the Ibn-La'Ahad/Auditore/Kenway/Miles family, McFarlane Toys may have something for you with the Golden Age of Piracy three-pack. Bartholomew Roberts was never called "Black Bart" during his lifetime, but that's how the toy is identified. The most successful pirate of his time, he was only active between 1719 and 1722, but captured over 470 ships in those three years. Before that he was third mate on a slave ship that was attacked by pirates, and forced to join their crew; he found favor with the captain, Howell Davis, because they were both Welsh and could communicate without the rest of the crew knowing what they saying. Roberts was a good navigator, and after Davis was killed, the crew elected him the new captain. In his book A General History of the Pyrates, the pseudonymous Captain Charles Johnson reported that Roberts would dress in his finest clothes before a battle. 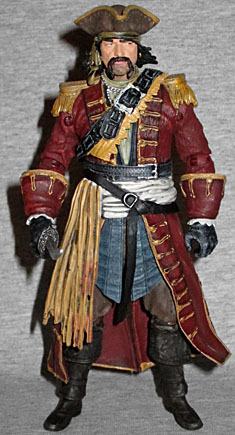 This figure is wearing a dark red longcoat with gold trim and fancy epaulettes. Beneath that is a shorter blue coat and brown pants. Roberts was described as a tall man with a dark complexion; everything else about him is just extrapolation and imagination. Without his removable hat, the figure stands just over 5¾" tall. He has a handlebar mustache and painted stubble, and he's painted with his eyes looking way off to the left - it makes him appear shifty. Outside of this set, Black Bart is an Amazon exclusive - which may explain why his accessories are so few. Other than his hat, he has a sword, a flintlock pistol, and a rifle with a bayonet. Unfortunately, he doesn't have anywhere to stow the weapons he's not using at the time, so even with his hands filled, there will always be one piece that ends up just laying on the ground. We move from the most successful pirate to the most famous. Even if you can't name any other real pirates, you know the name Blackbeard. Edward Teach (or Thatch) gained command of his own ship in 1716, and was killed in 1718. So despite only being active for two years, he cut such a fearsome figure that he went down as the pop culture pirate. Heck, even his name is archtypical: if anyone is going to pose as a pirate, odds are that their made-up-on-the-spot name will be (Something)beard. Blackbeard might as well be Blackcoat, because that's what he's wearing: a black coat. And a shorter black jacket beneath it. And a black shirt. And black pants. And black gloves. And a black hat with large black feathers. You can probably guess what color his boots are, too. That's right - brown. Those, the brown bandolier and the red sash aren't the only spots of color on his clothes (there's lots of fancy trim painted on the coats, and he has a frilly white cravat), but this is, overall, a very dark toy. Without his hat on, Blackbeard stands 5⅞" tall. He's wearing a red bandana tied around his crown, so we don't get to see the burning pieces of rope that he would stuff under his hat (not, as is often rumored, fuses tied into his beard). His beard is sculpted with a series of braids, and he has a small ponytail at the back. Edward comes with the same sword that Black Bart did, and we already mentioned his hat. But Blackbeard's typical style was to go into battle with bandoliers of pistols strapped across his chest, and this one delivers. Remember when Pirate Spawn had one of those, and you couldn't remove the guns from it? Not a problem here! He has four different pistols, and you can put them in the loops in whatever order you like. Our final pirate in this set is Benjamin Hornigold, a pirate who's best known for Edward Teach being his first mate - in fact, Hornigold is the one who put Blackbeard in charge of a ship in 1716. His first known acts of piracy were in 1713, when he raided ships by canoe. He once attacked a sloop off the coast of Honduras solely to steal the passengers' hats (because his crew, having gotten drunk the night before, threw theirs overboard). In 1717 his crew mutinied because he refused to attack British ships; in 1718 he received a governmental pardon, became a pirate hunter, and went after Calico Jack. 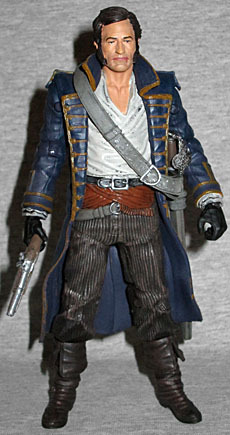 Hornigold is the only figure in this set who is also available at mass retail (just like Black Bart is only available at Amazon, Blackbeard is exclusive to GameStop). He's also the only one without a hat. Conspiracy! He's wearing a dark blue coat with gold trim, a white shirt, and brown corduroy pants. His shoulders seem broader than the other two pirates', making him look brawnier. He's also the only pirate to come with a scabbard. No hat means no bandana, and no bandana means we can actually see his hair. It's comparatively short, in that it barely touches his collar. He also has the shortest beard - in that he has no beard at all. He's just rocking a mighty set of muttonchops, and is otherwise clean-shaven. He's looking straight ahead, and has a bit of a frown on his lips. 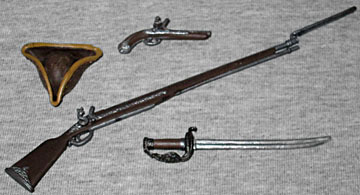 Benjamin Hornigold has the same accessories as Black Bart: a cutlass, a pistol, and a rifle. All the figures have the same articulation, as well. They each move at the ankles, shins, knees, hips, waist, wrists, elbows, shoulders, and head. Most of the joints are some combination of swivels and hinges for the best range of motion, but they're really not designed very well. Let's face it: NECA spoiled us with the articulation in their Assassin's Creed figures, and that's an awfully high standard to meet. 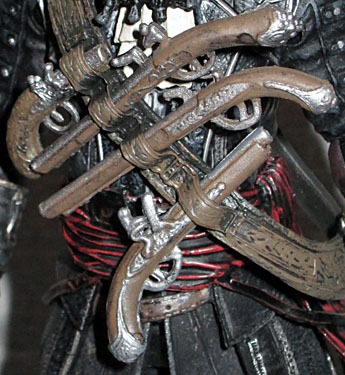 None of the pirates have extended trigger fingers, which makes using guns kind of difficult. I just recently finished AC3, so it's going to be a while before I even consider getting AC4 to play. But you don't need to be a fan of the games to get the Golden Age of Piracy set; the fact that these are just three cool pirate action figures is enough.